Wilden’s Advanced metal series T1510 air-operated double-diaphragm pumps, known as the Brahma, are designed for harsh solid-handling applications. 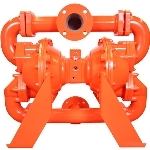 This completely submersible product is a 76mm (3 inch) flap-valve pump with bolted construction. The pump’s large internal clearances and top-suction/bottom-discharge operation eliminate clogging, which allows for flow rates up to 977 lpm (258 gpm) and maximum pressures to 8.6 bar (125 psig) with a maximum dry-suction lift capability of up to 7.4m (24.4 feet).